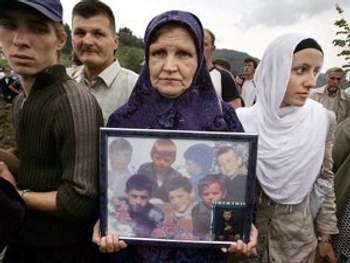 Serbs targeted for extinction 40,000 Bosnian Muslims living in Srebrenica. More than 8,300 Bosniaks had been summarily executed and another 30,000 had been forcibly expelled in a massive scale ethnic cleansing campaign. Srebrenica massacre was Europe's worst act of genocide since World War II. Additional 297 victims, for example, listed on the Federal Commission’s list (not included in this breakdown) are age-unidentified and there is more victims who have not even been included in the list. 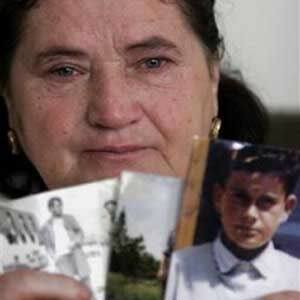 The Federal Commission’s list contains a list of at least 8,106 Srebrenica genocide victims in order of First/Last Name, Father’s Name, JMBG ID#, and DOB. display in the visitor’s center in Srebrenica. The list includes the names of Safet Fejzic, another child killed by Slobodan Medic and his Scorpion accomplices, but I don’t see the name of Juso Delic there, who was the third child among their six victims. This crime of crimes is celebrated by many Serbs. The world has not only punished the Serbs but awarded them for the whole campaign of genocide in the Republic of Bosnia Herzegovina (with the creation of the entities that divide Bosnia and cause misery to everyone). Who is the subject of the photograph you have used and the source? 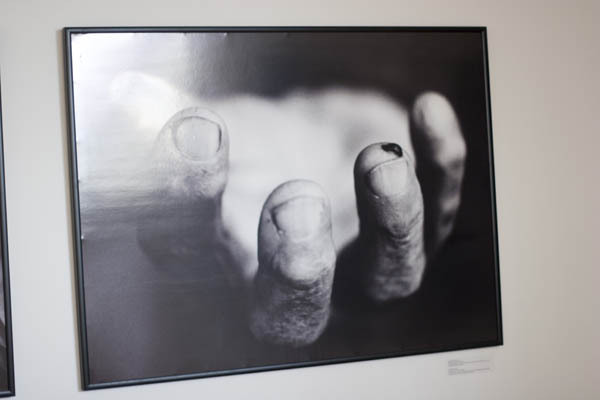 The images used were published on the occassion of the 12th anniversary of Srebrenica Genocide. If you go to our Questions and Answers page, you will find more images from Reuters and Associated Press. I am using them under “Fair Use” policy for educational and research purposes, (non-commercial use). Fair use is a doctrine in United States copyright law that allows limited use of copyrighted material without requiring permission from the rights holders. Dan, I was thinking that those may be faces that go with some of the names on the list. I am extremely sorry for all the people who have died. I am possitive they are doing great in Heaven and I really hope they rest in peace. It must be terrible to lose a family member so I give you my full sincereness. There were a great number of very young children in that list. An organization that raises money for the education of children from Srebrenica who lost their parent(s) from 1992-1995. Niños Víctimas link working now, so you can remove previous comment. 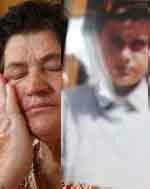 Mirsada Bosnjakovic was showing to the International Policemen a photo of her husband Meho and her 13-year-old son Amer. Meho was at the time a translator with MSF and his employers did not try to protect him during the critical days in July, while her son was brutally taken away from Mirsada by Serbs who pushed her to the ground. “This is my son. He was 13 and they took him away. See what kind of people they are!”, Mirsada poured without a pause. Kutil, the information about the birth dates of SMAJLOVIĆ FAHRUDIN (01.01.1983), and BOŠNJAKOVIĆ MEHO (11.09.1982) is accurate and is listed on the Federal Commission’s List representing a minimum of 8,106 victims of Srebrenica genocide. Therefore, your sources might have typing errors in them, so I will stick to the official data (it’s not up to me to change this list, as this is not my list). If you wish to get in touch with me, mark your comment “PRIVATE” and leave me your e-mail address and I’ll get in touch with you. NOTE: The list of killed children represents only a minimum of identified child victims of Srebrenica genocide. I can’t forget the terrible haunted look of the young boy in the purple pullover at the back of the group filmed by a Serb cameraman coming down from the hills to hand themselves over to face what they knew was going to happen. The sequence is included in “Cry From The Grave” just after Ramo Osmanovic is forced to call out to his son Nermin to come down from the hills and not be afraid of the Serbs. The image of that child’s face should be hanging on the walls of every United Nations building and in a central position in the Serbian National Assembly. Dan, has his identity been established? Owen, I also thought that image was very haunting when I first saw it, and still think so today-certainly an indelible symbol. There is some good news though, unlike so many other boys, the boy in the still frame in Enver Husic-and he survived. He was 17 years old in 1995. Unfortunately, Enver’s father was killed. Enver testified as a prosecution witness in the Krstic case. Domovina.net has a documentary on the Krstic case (“The Triumph of Evil”). *Around the 29minute point (maybe 28) there is the shot of Enver. After that, they segway into his testimony at Krstic’s trial. And of course the UN ICTY website has his complete testimony. Owen, I read the Sudetic article before & I’m glad to see you publicizing it. Especially since, I think, the horrible conditions in 1993 are probably not as well known. there’s a new website with pictures and film, it’s from 1994.
refik ibrahimovic, he was a son of a police chief in srebrenica. Shaina, thanks for the info and the references. That’s extraordinary. I’ll check out his testimony – I wonder what the story of his survival was. Thanks for the link, Huib. It’s very strange watching those films. Owen, i made some of these film and pictures. We (Dutchbat1) had a very good contact with the local people in srebrenica. i stayed in potocari. I just cant belive those people how could they have the guts to kill so many children and elderly men!? I hope that those who still live have night mares for the rest of their lives!!! I hope they rot in hell! They deserve to be treated like slaves, they deserve to be spat on! Inshallah Justice will be served! Bosnia Lives On! 11/07/1995 NEVER FORGET SREBRENICA REST IN PEACE ALL! So how come NOBODY is doing anything about this??? People also in the USA should know about this GENOCIDE that DID happen. SERBS have been starting wars for over 500 years now, what makes you think they will stop??? 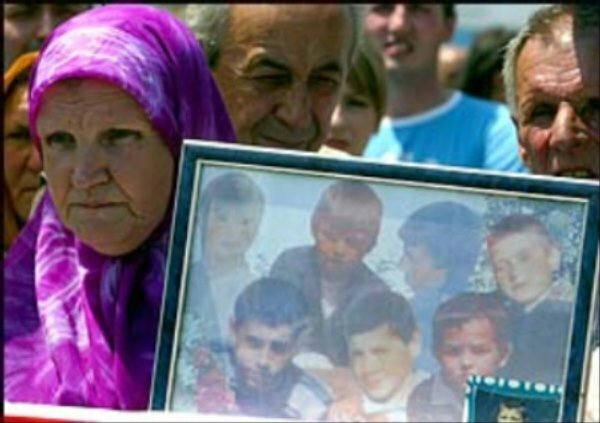 SERBS celebrate SREBRENICA, its their pride, its their childrens PRIDE. WHY IS THE WORLD QUIET??? WHY ISNT ANYONE DOING ANYTHING ABOUT IT??? Hi! I’m a Bosniak living in Serbia. Both of my parents are from Bosnia (ethnic Bosniaks) but I was born and grew up in Belgrade, where I still live. I must say that what you wrote there isn’t true really, and at least that one thing is good. If you mean Bosnian Serbs (by saying “SERBS”), then it may be true – I wouldn’t know. But if you’re speaking of Serbs from Serbia, let me tell you that it’s a minority of Serbian people round here that deny the massacre in Srebrenica or approve of it. That’s bad enough because if there’s even one single person denying this horrible tragedy – even that’s too much and too disrespectful to the victims and their families. However, such generalization (and an emphasized one –> “SERBS”, as you say) is wrong, believe me. I’ve been here, in Belgrade, witnessing the public confrontations between those who deny the massacre or find excuses for it (of course no sane person would even try to look for an excuse for such an inhumane act of madness and hatred towards innocent people! ), on one side, and those Serbian people (Serbs from Serbia) who openly confront them in public. And, actually, such Serbians – those who raise their voice against this war crime and want Mladic and Karadzic arrested and extradicted to the ICTY in the Hague – are not only a few… they are many. You certainly can’t say they’re proud of what happened in Srebrenica, neither that it’s their children pride. That just isn’t true. Those people have risked a lot in their conflicts with nationalistic groups in Serbia (that mostly include hooligans and Serbian Radical Party), yet they’re still protesting against the fact that Karadiz and Mladic are free, and they’re not giving it up. The documentary about Srebrenica was shown on Serbian TV’s numerous times, various NGO’s and activist groups of citizens have fought against this denial of or approval of the massacre in Srebrenica… As a member of Bosniak minority in Serbia, I do not feel alone in my grief. Absolutely all my Serbian friends round here feel the same about Srebrenica as I do. Those are not the people who voted Milosevic, neither at the time when he instrued this war crime, not before and after – on the contrary, they’re the people who spent the best years of their lives protesting against Milosevic’s regime. So, I have to be honest and tell you that to generalize like that and say that SERBS (which, especially written in capitals, would mean “all Serbs” – and that’s far from the truth)are proud of the massacre in Srebrenica, is really wrong. Labeling the entire Serbian people as “chetniks” – which I’ve found elsewhere – is just as wrong. There are many people who truly care, who feel compassion and deepest sympathy with the families of the victims of Srebrenica massacre, who are angry because fascists like Mladic and Karadzic did such things in their name (in the name of Serbian people), who would most definitely – if only given a choice – be much more severe judges to those two criminals than ICTY could be. murdered by Serbs, but by Croats. But although we all know what Croatian army did in Mostar, I won’t say it’s a proud of CROATS and their children. Some Croats – yes, but not all. My point is, generalization is wrong and it’s not the way to truth and justice. Criminals have their names, it’s them who are responsible and it’s them who must be punished for what they did. Them, those specific people, and not the entire nation. I’d certainly never compare my family’s loss and grief to that of the mothers who lost their young sons in Srebrenica, and I can only try to imagine what a nightmare this life has been for them. I truly hope they’ll see the day when those responsible for the brutal killings of their sons, brothers and husbands are caught and punished. That won’t bring the victims back, but it will give at least some little peace of mind to their families who have been waiting for justice for years now, haunted by the fact that the criminals are out there, free. The victims will never be forgotten. We’ll all keep the memory of their tragic deaths, wait to see the criminals persecuted (and I do believe that I’ll live to see that day), spread the word of truth and hope that the souls of all the victims rest in peace. Dijana, I agree with you. I am glad that Karadzic is finally arrested. I am embarrassed that it did not happened sooner. The best time of my childhood and teenage days was so much influenced with those events that I could not do a thing to change them. Nobody from my large family or friends was not part of that but however I feel responsible that we did not do what we did on the October 5th 2000 sooner, maybe we could change some of those terrible events that happened. Thank you very much for your blog. The amount of hatred in some serbs is incredible. I guess they cannot feel good without hating somebody. Every time they uncover a new mass grave in Srebrenica it’s like they kill us all over again. Those poor mothers having their children taken away from them to be killed… We depend on people like you to tell the truth. It’s not easy to stay calm when you hear people deny what happened, or say, oh well they killed each other. I hope that ALL war criminals from ALL sides will be dealt with. The list was published by the NGO Women of Srebrenica. READERSHIP STATISTICS FOR JULY 2009.